9 А.М. Divine Liturgy/Божанствена Литургија. Saturday Evening, April 20th, Children’s Vrbica Procession with Bells and Palms and Vespers Субота увече , 20 Април. Вход око цркве са звонцима и врбима и Вечерње. 4 PM Vespers/ Вечерње у 4 часова. Sunday, April 21st, Palm Sunday /Недеља, 21 Април, Цветна Недеља. 7 PM - READING OF THE 12 PASSION GOSPELS OF OUR LORD JESUS CHRIST / ВЕЛИКО БДЕНИЈЕ СА ЧИТАЊЕМ 12 ЈЕВАНЂЕЉА О ХРИСТОВИМ СТРАДАЊИМА. 930 Matins for the Lamentations of the Mother of God / Јутрење, Плач Бородоице, Статије. 10 PM PASCHAL MATINS /Пасхалне(васкршне) Јутрење. 10 AM Divine Liturgy/Божанствена Литургија. Blessing of Pascha(Easter) Eggs and Food Baskets and banquet. Pascha Sunday Evening. April 28/ Недеља Светла 28 Април. 930 AM Divine Liturgy/Божанствена Литургија. 9 AM Divine Liturgy/Божанствена Литургија. 5 PM Vespers and Dinner/ Вечерње и Вечера. Мај 113-a Парохијиска Слава и Банкет. Followed by lenten potluck and spiritual conversations. Saturday Evening , March 30th. Субота увече , 30 Март. 5 PM Vespers/ Вечерње у 5 часова. Great Lenten Vespers at St. Holy Trinity at 5 PM /Великопосно Вечерње у храму св. Тројице у Ленекси у 5 час. The current church building was constructed in 2006 and is located near College Boulevard and Pflumm Road in Lenexa. Apostolic Christianity in Serbia (located in Southeast Europe) dates back to the seventh century. Christianity eventually became the state religion, and the Serbian Orthodox Church received ecclesiastical independence in 1219 with the consecration of St. Sava as the nation's archbishop. Orthodox Christianity became the country's primary religion and remains so to this day. 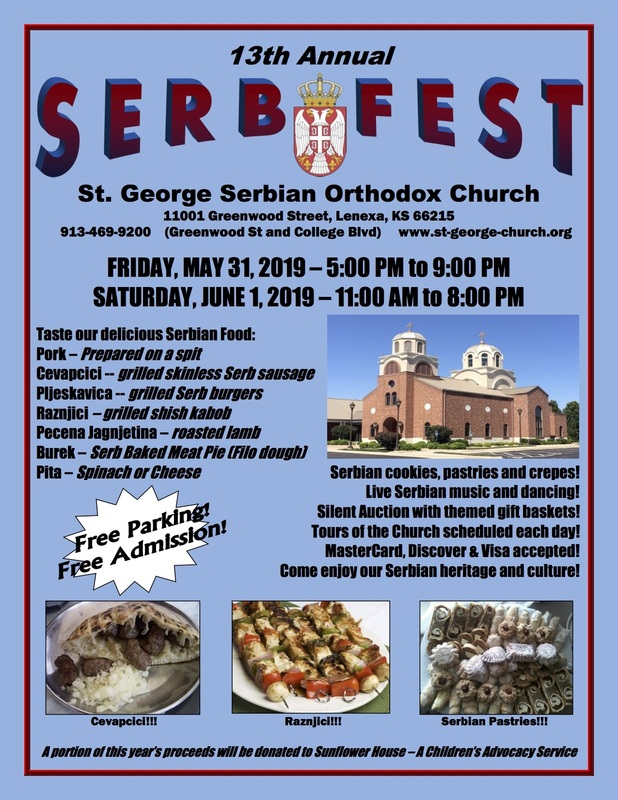 During a wave of immigration to the United States in the late 19th and early 20th centuries , a Serbian community was established in Kansas City, Kansas. The community constructed a meeting hall, which held occasional services until St. George Church was chartered on April 18, 1906 in a home that was remodeled into a small church building. A more permanent church building and meeting hall was constructed in Kansas City, Kansas at the corner of Bethany and Lowell in 1925. This remained the location of the parish until 2006, when the new St. George church building (pictured above) was consecrated in Lenexa, Kansas. 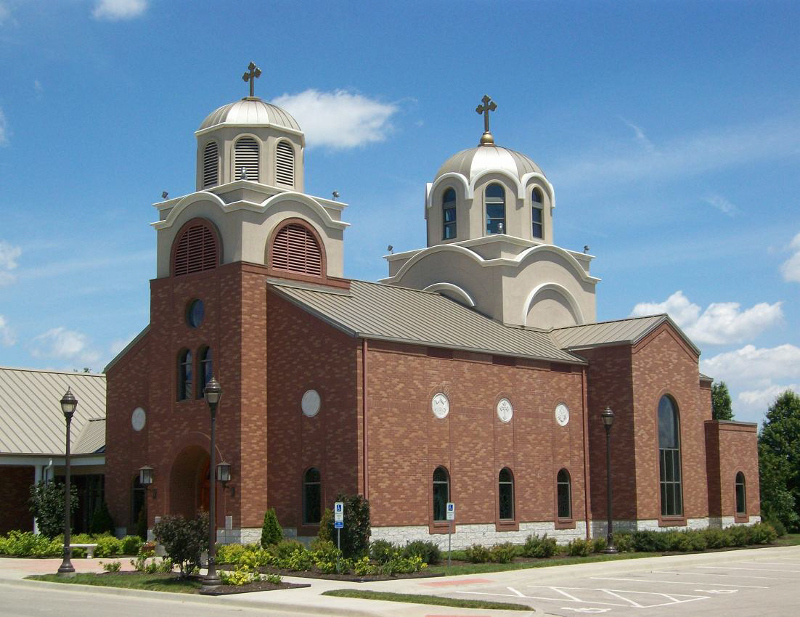 St. George Church continues the tradition of Orthodox Christianity that can be traced from that original Serbian community in Kansas City, to Europe, to the Apostles. Visitors are welcome at our church services and special events. Contact Father Radomir if you have questions.